I recently got a deal on red white and blue Sperry style loafers. They cost me $8 which is still a little more than I like to spend on shoes. So I now have the obligation to make sure I have as many things to wear with them as possible. Got to get that $8 out of them… yes… I… am….that…CHEAP! 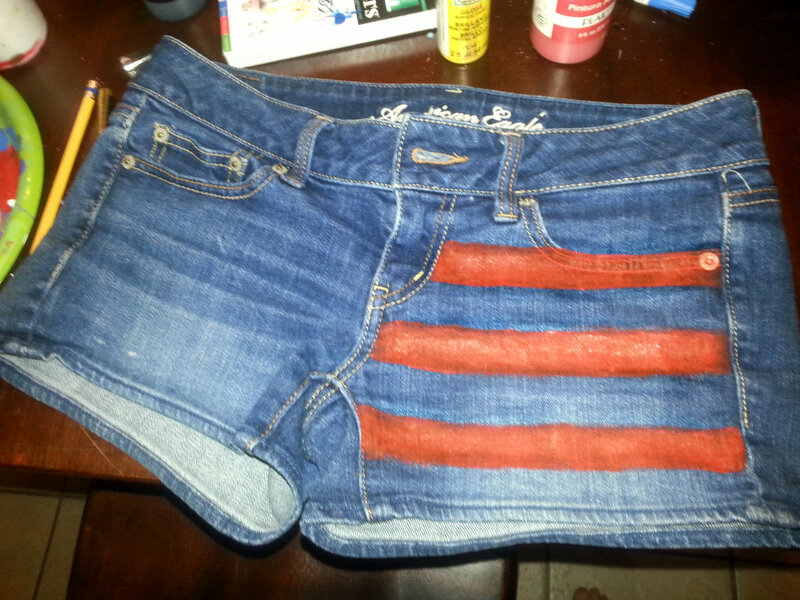 So I decided to repeat a DIY I tried for the 4th of July. I got so many compliments on my shorts! So I made a second pair, (technically a third, my first pair ended up being 2 sizes to small.) My pride was tarnished but I soldiered on with a larger pair. 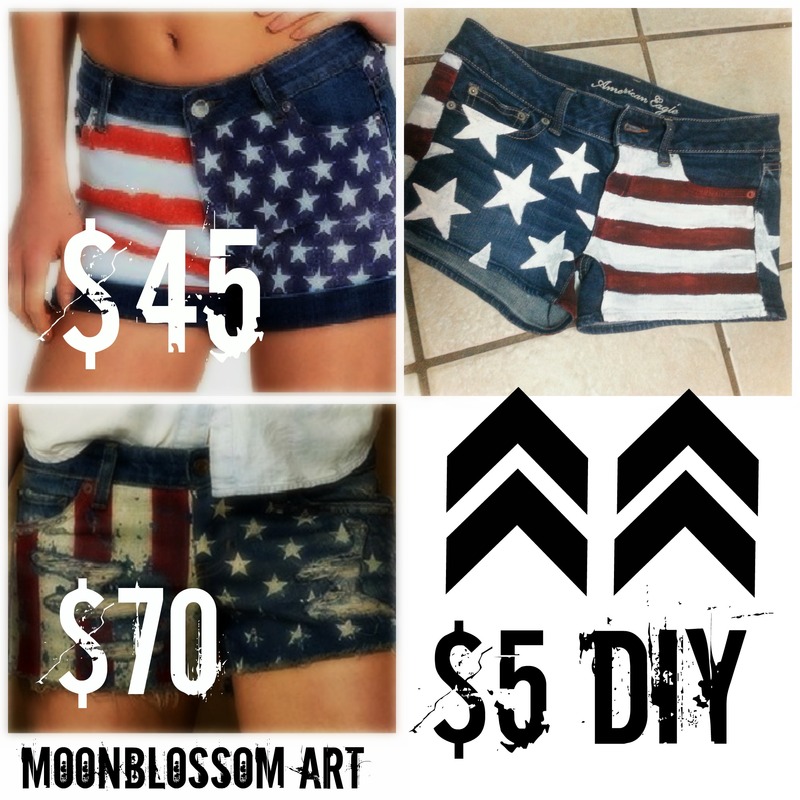 Let me start by saying, American flag shorts have made a come back therefore they are expensive! I don’t like to spend more than $5 on shorts or $10 on jeans, so buying a pair was out of the question. Step 1: Lay shorts flat. Starting at center seam paint a red line straight across to side seam. If you are not confident in your straight line skills you can mark it off with tape. As your paint dries it will darken. I personally think it looks more rugged, but if you’re looking for a bright pop of red, I would recommend going over each line again after they dry. Step 2: Fill the spaces in between with white paint. Pocket lining and waist band are completely optional. The orientation of your stripes are also completely optional. Step 3: To put on the stars you have a few options. a) freehand them on with paint and brush. 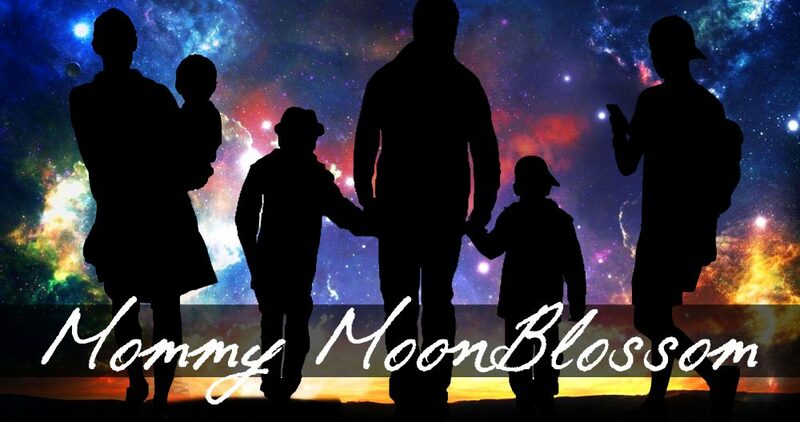 b) using chalk or paint pen, draw on stars then fill in with paint. c) purchase a star stamp from hobby store. I personally found it easy to just draw a five point star using a paint pen (it goes on very faint) When they where placed where I wanted, I painted them in using white paint. Step 4: Repeat on the back. Getting into the crotch area will be tricky. You will have to hold you hand in the crotch and maneuver you lines around. 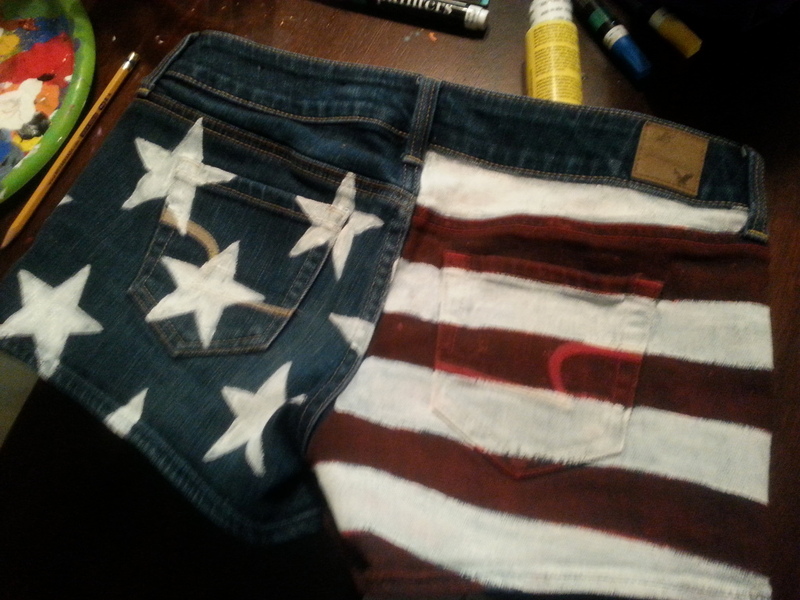 Another style for the back I have seen is just painting the pockets stars and stripes. Up to you! I made another pair that where washed using regular washing powders and dried in my dryer several times with the rest of the laundry. That pair did fade but colors did not run. They have that really rugged look, like the ones pictured in the collage for $70. If you want to keep them as bright as possible you can try sealing with an acrylic sealer though it may cause extra stiffness. For washing, turn inside out. Wash on light cycle using a Tbsp of baking soda. Baking soda will clean the shorts from regular wear without harsh chemicals that are in usual detergents. Lie flat to dry. For an in between bright and rugged look try washing like you would anything else then using the baking soda method. 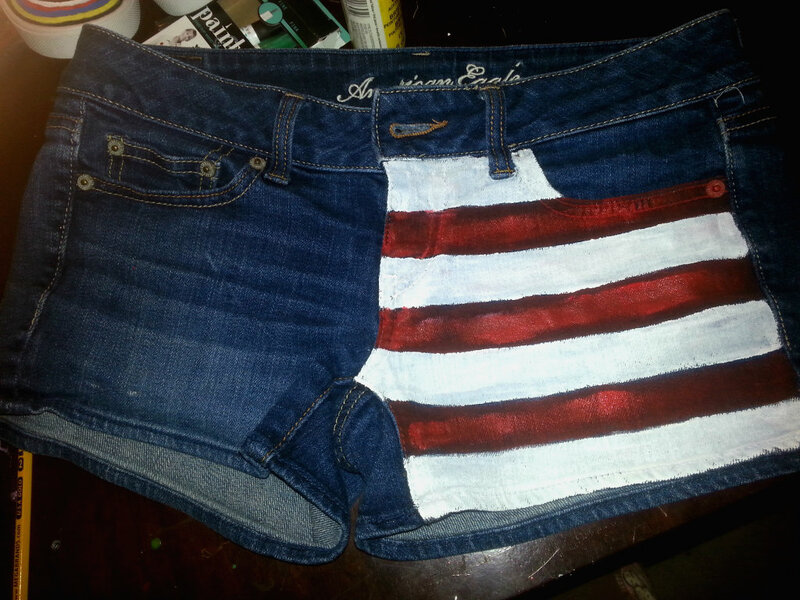 Hope you give it a try and enjoy your new patriotic shorts! 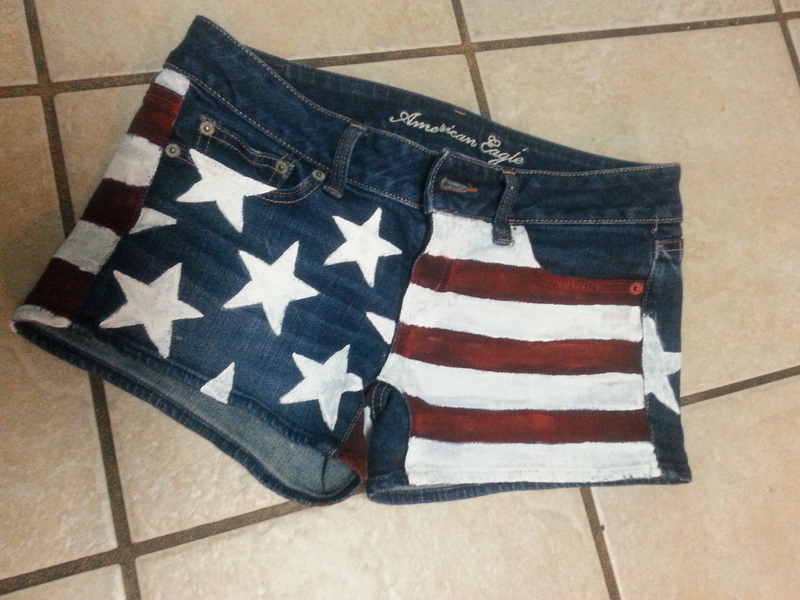 This entry was posted in DIY and tagged Acrylic paint, american, crafts, DIY, Do it yourself, fabrics, fashion, flag shorts, July, Paint, patriotic, red white and blue, retro by Sunnie Wicker. Bookmark the permalink.